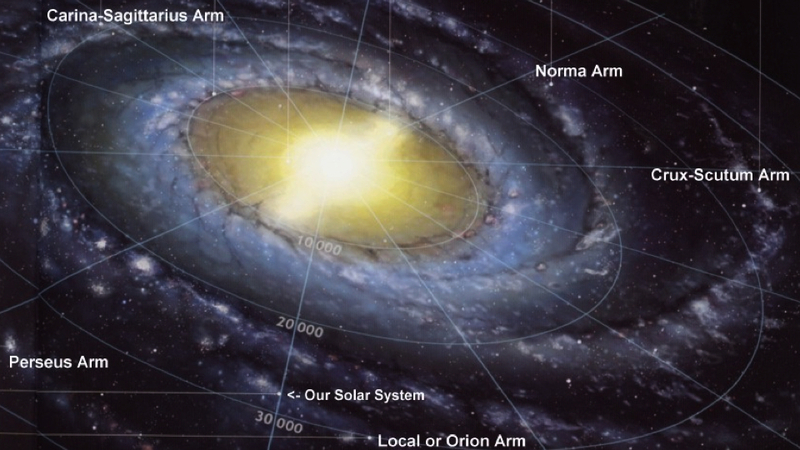 Today it is generally accepted as a scientific fact that the Earth is one of eight planets which revolve around the Sun, that the Sun is one of 400 billion or so stars in our Milky Way galaxy and that the Milky Way is one of hundreds of billions of galaxies in the observable Universe. However, for most of human history a geocentric model was the standard explanation of the cosmos. In this model the Earth is the the centre of the Universe and all the planets and stars revolve around it. Although it has been long superseded, this model could actually still be used to predict the motion of the Sun, Moon and the planets to a reasonable accuracy. Anyone watching the sky over a period of time will notice that the Sun rises in the east, is at its highest in the sky at midday and the sets in the west. Like the Sun, the Moon and the stars also rise in the east, get higher in the sky and set in the west. 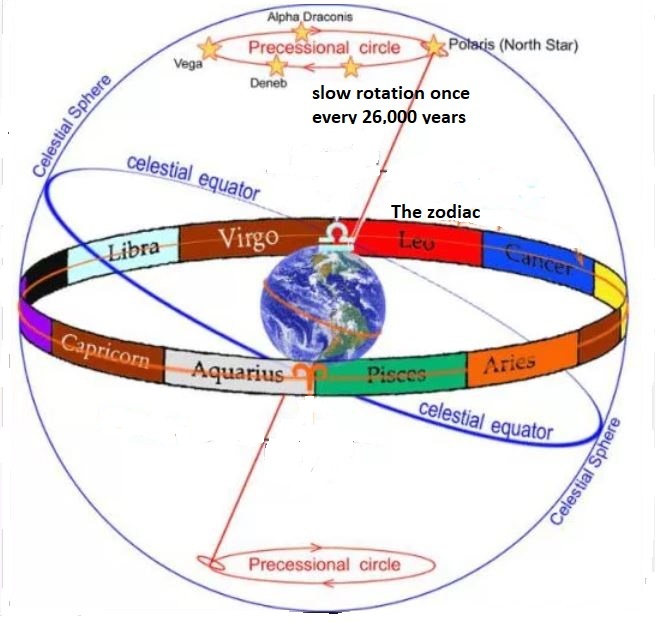 It was perfectly natural for ancient astronomers to assume a geocentric model in which the Earth doesn’t itself rotate but that the Sun, Moon and stars all rotate around it. After all, people on the Earth do not actually feel that it is rotating. The name most associated with the geocentric model is the ancient Greek astronomer Claudius Ptolemy. He lived in Alexandra, Egypt in the second century CE, although no one knows the exact dates of his birth and death. Ptolemy didn’t invent the geocentric model – no single astronomer did. Ptolemy’s contribution was to refine the model which had been built up by Greek astronomers over the previous centuries, so that it could accurately predict the positions of the stars and planets. An early version of the geocentric model is shown in the diagram above. At the centre of the Universe was the Earth. The Earth did not rotate and was surrounded by a set of eight invisible spheres to which the Sun, Moon, planets and stars were attached. The outermost of these spheres was a sphere of fixed stars. All the stars were attached to this sphere. Moving inward from the sphere of fixed stars were Saturn’s sphere, Jupiter’s sphere, Mars’s sphere, the Sun’s sphere, Venus’s sphere, Mercury’s sphere and finally, closest to the Earth, the Moon’s sphere. 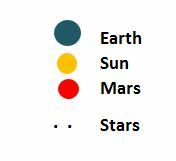 To simplify the diagram, only the sphere of fixed stars, the Sun’s and Mars’s spheres are shown. To a viewer in the northern hemisphere, the sphere of fixed stars rotated anticlockwise around a point in the sky directly above the North pole, known as the North celestial pole, once every 23 hours 56 minutes (see note 1). As viewed from Earth, the Sun’s, Moon’s and the planets’ spheres rotate more slowly than the sphere of fixed stars. For example, the Sun’s sphere takes 24 hours to complete a single rotation ,compared to the 23 hours 56 minutes for the sphere of fixed stars. So, compared to the sphere of fixed stars, the Sun’s sphere slipped back by around 4 minutes giving it a slow backwards rotation. 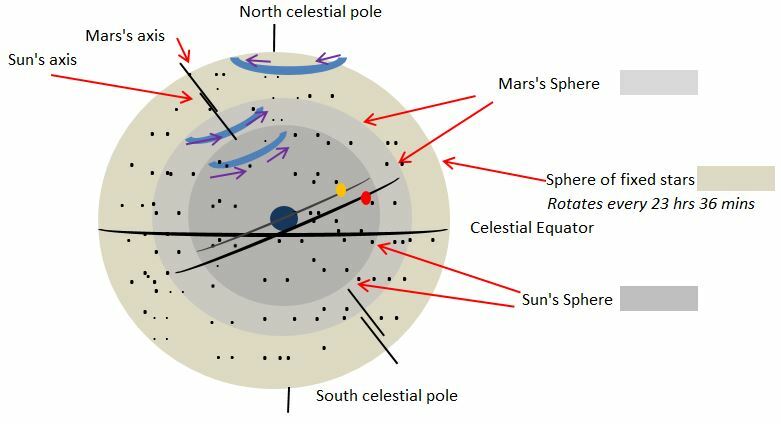 The diagram above also shows that axes about which the Sun’s, Moon’s and planets’ spheres rotated didn’t go through the North pole but was inclined at an angle to it. The diagram below shows a two dimensional slice through the model with the Sun, Moon and all the planets shown. If you observe how a planet moves over a period of time you will notice that it does not move at a steady rate. At times it will move more slowly against the background of stars, stop altogether, move in the opposite direction, stop again and then continue moving in the original direction. 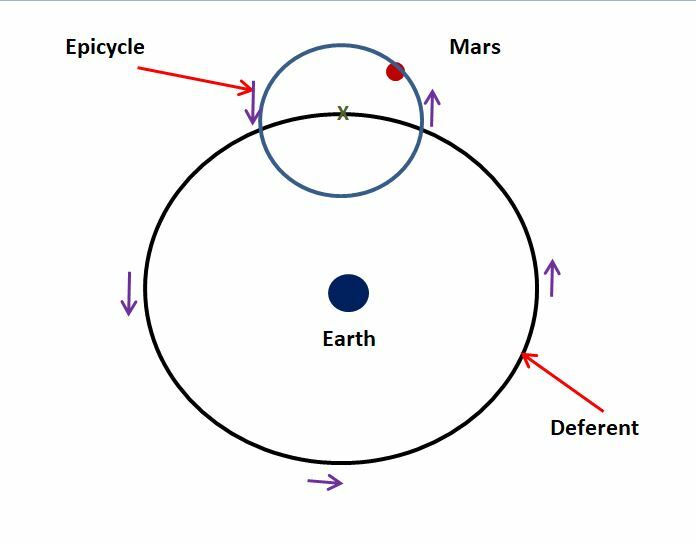 The reason for this is shown for one of the planets, Mars, in the diagram below. 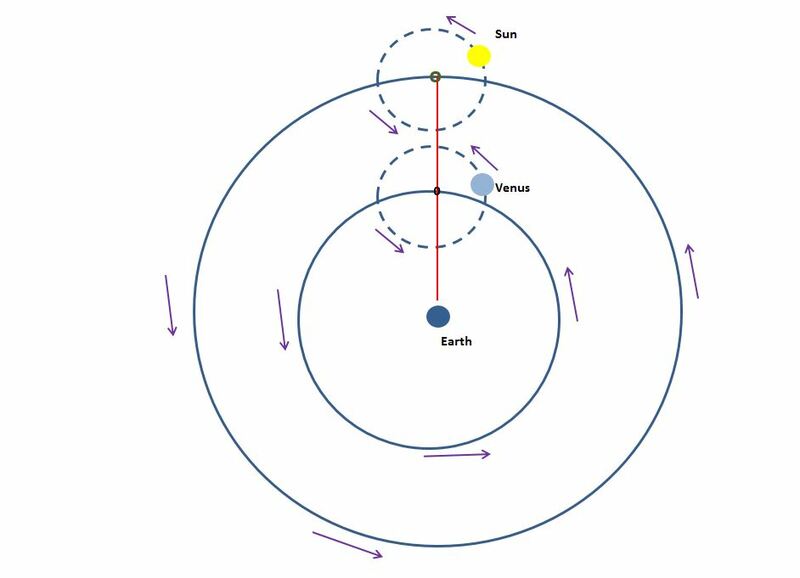 As you can see from the diagram, the Earth is closer to the Sun than Mars, and moves faster in its orbit. At point 3, the Earth approaches Mars; to an observer on the Earth, between points 3 and 5 Mars will appear to change direction and move in a reverse direction against the background of stars. When it reaches point 5 the Earth is receding from Mars and so Mars will continue in its normal direction. 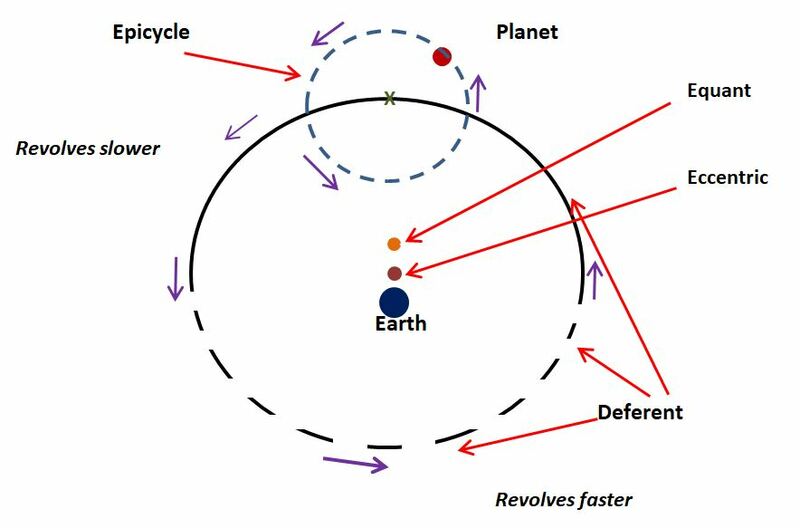 In the geocentric model the apparent uneven speed and change of direction of the planets’ motion was explained by introducing a concept known as an epicycle. Rather than than revolve directly round the Earth, a planet moves at constant speed in a small circle called an epicycle. The centre of the planet’s epicycle, marked with an ‘x in the diagram above, moves in a circular path around a larger circle called a deferent. For each planet the Earth lies at the centre of its deferent. At times the planet will be moving in the same direction as the orbital motion of the deferent and other times it will moving in the opposite direction. This will make the motion of the planet appear to be uneven – in keeping with the observations taken by the ancient astronomers. Mercury and Venus differ from the other planets in that, to an observer on the Earth, they never stray too far away from the Sun and, to viewers at low latitudes they can only be seen for a few hours after sunset or a few hours before sunrise. For this reason they were known by the Greek astronomers as the the inferior planets. The superior planets (Mars, Jupiter and Saturn) are not tied to the position of the Sun and at certain times were visible in the middle of the night. The reason why Venus and Mercury always appear in the same part of the sky as the Sun is that their orbits lie inside the Earth’s orbit. This is shown in the diagram below. Venus cannot appear more than 46 degrees away from the Sun. The green line shows the limits of Venus’s apparent position from the Sun. 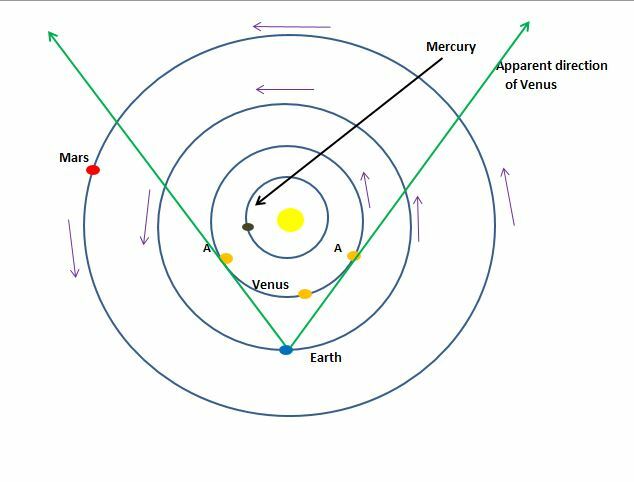 In the geocentric model this was explained by locking the Mercury and Venus’s motion to that of the Sun. The centres of their epicycles took exactly 1 year to orbit the Earth and were always in a direct line between the Earth and the Sun. This is shown in the diagram below. As Venus moves around the Earth the centre of its epicycle always lies on the red line between the Earth and the centre of the Sun’s epicycle. This ‘locks’ the position of Venus to the Sun so that, to an observer on Earth. it cannot appear too far from the Sun. Mercury is locked in a similar manner. Fine tuning the geocentric model. The geocentric model which I’ve described so far had been developed by astronomers in the centuries before Ptolemy, although very little of the early astronomers’ original writings survive. Ptolemy’s contribution was to make two further modifications to make it more accurately fit observations of stars and planets. The first one I’ll describe is to deal with a phenomenon known as the ‘precession of the equinoxes’. Even though the telescope hadn’t been invented, Greek astronomers had been taking precise observations of stars and measuring their positions for hundreds of years. Although the stars appeared fixed with respect to each other, over hundreds of years the alignment of the entire celestial sphere was slowly moving with respect to the Earth. An effect of the precession of the equinoxes is that the pole star gradually changes. Today the bright star Polaris in the constellation Ursa Minor (the Little Bear) lies near the celestial North pole and all the other stars appear to rotate around it. In Ptolemy’s time another star in Ursa Minor, β Ursae Minoris, was the pole star and in about 13,000 years time the bright star Vega will lie close to the celestial North pole. Ptolemy explained procession of the equinoxes by giving the celestial sphere an additional very slow rotation once every 26,000 years about a different axis in addition to its daily rotation around the Earth’s North-South axis. Ptolemy had to make one more adjustment to the model to allow it to fit historic observations of the stars and planets and thus be able to accurately predict their future positions. Even when epicycles were added, the position of the planets was not where the model predicted they would be. The motion of the planets was still uneven compared to the background stars. The reason for this is that the planets move around the Sun in elliptical (oval-shaped) orbits and the speed of a planet is fastest when it is closer to the Sun (see note 2). This is shown in an exaggerated form in the diagram below. In reality none of the planets’ orbits are actually this elliptical. However Ptolemy, like all other Greek astronomers before him, believed that the all the planets’ deferents and epicycles must be perfect circles. This was for philosophical reasons, as the heavens were the epitome of perfection and the circle was seen as a perfect shape. 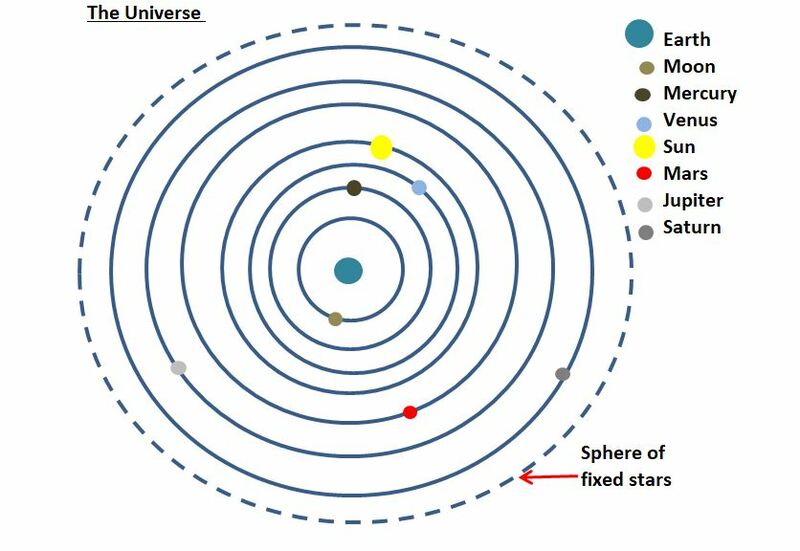 So what he had to do was to modify the geocentric theory in a way summarised in the diagram below. when it was further away it moved more slowly – the solid line. The uneven speed was such that for each planet there was a point called the equant, at which the deferent would appear to move with a constant speed. A further complexity was that distance between the Earth, the equant and the eccentric varied for each planet. So, strictly speaking, Ptolemy’s theory wasn’t truly geocentric, because the planets didn’t orbit the Earth, but each of their deferents orbited a hypothetical point called its eccentric which was offset from from Earth and was different for each planet. However, the theory fitted the observations in that it was possible to work out the past and the future position of the stars and planets using it. 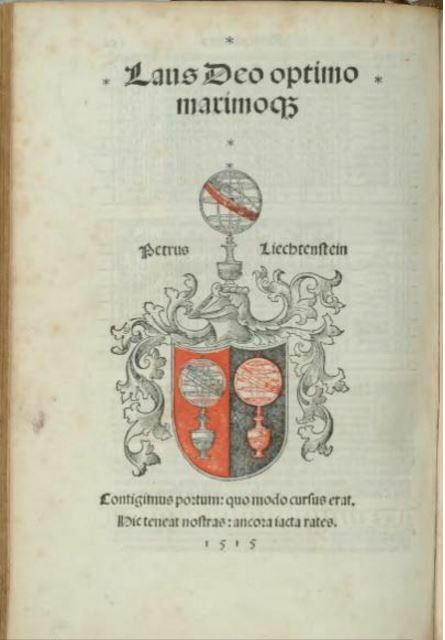 In around 150 CE Ptolemy published his theory in a book called ‘The Almagest’, which over the succeeding centuries was translated into many languages including Arabic and Latin and became the most influential astronomy textbooks for the next 1500 years. (1) To a viewer In the southern hemisphere, the sphere of stars wold appear to to rotate clockwise around a point in the sky directly above the South pole. The orbit of a planet is an ellipse with the Sun at one of the two foci. A line segment joining a planet and the Sun sweeps out equal areas during equal intervals of time. For me a refreshing upgrade. Looking forward to your next post. Thank you for the interesting read. I’m glad this good, thorough explanation was called to my attention. This brings to mind a post I wrote essentially on the same topic, though yours is far more detailed in explanation. I especially admire your sweet explanation and chart for ‘retrograde motion’ And overall, the post do its job with your usual clarity. By the way, I love using that phrase, in Hebrew , whenever I lose an argument and am forced to capitulate here in Israel. A surprising % of folks recognize it, laugh, and appreciate the mood-lightening moment. Looking forward to the relief of your next post. Thank you for your comment and glad you enjoyed my (rather long) post. I think that Ptolemy’s theory was pretty good for its time and it fitted the facts in the sense that it was possible to predict the positions of the planets to a ‘reasonable accuracy’. To ancient civilisations it was clearly much more intuitive to believe that the Earth is stationary and everything else moves around it. Ptolemy thinking, like all astronomers before him, was limited in that he believed that all orbits must be perfect circles. Anything else would have been unthinkable.